For a nation that averages merely 125 miles in width, Chile boasts a mind-boggling array of natural environments, ranging from the driest desert in the world to lush rainforest, icy blue glaciers to fiery volcanoes, and gushing rivers to farmlands and vineyards. No matter what experience you're seeking, Chile has it all. Chile stretches over 2600 miles from Peru in the north to the Strait of Magellan in the south. The western coast borders the Pacific Ocean, while much of the eastern edge of the country shares the world's second highest mountain range, the Andes, with neighboring Argentina. Considered a very safe place to travel, Chile is home to some of the friendliest folk in the southern hemisphere, and the Chilenos themselves are what give the country its rare charm. Three quarters of the population lives in or around the capital city of Santiago in a region known as the Middle Chile, though the region covers only twenty percent of the country's area. 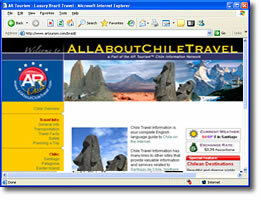 Chile's diversity of opportunities for tourism attracts sightseers from around the globe. Nearly all visitors will spend some time exploring Santiago's charms, but perhaps the most popular tourist destination in the country is the city of San Pedro de Atacama, in the heart of the Atacama desert. San Pedro's presence amidst such striking scenery, ranging from a line of volcanoes to the east, some still active, to the Cordillera de Sal, a mountain range to the west made almost completely of salt, deserves the attention it receives. Puerto Montt, to the south of Santiago, is a bustling port city and capital of the Lake District. Puerto Montt is the gateway to Chiloe, the southern lakes, and Patagonia, and is home to some of the better Chilean textile and craft markets. Also renown for its fresh local catch, the fish markets are a fun place to sample some of the local flavor-and if you're not too weary from a day at one of Puerto Montt's many beaches, try the waterfront cafes. The Carretera Austral (Austral highway), which continues south from Puerto Montt, makes Chile's Patagonia region more accessible than ever-- the $300 million dollar undertaking that took over 10 years to complete allows visitors to access the Patagonia region and experience firsthand all of its natural glory. The Torres del Paine National Park, in the heart of the Patagonia, has a very well-developed network of trails, allowing views of stunning peaks, glaciers, rivers, wildflowers and wildlife. If a mainland adventure isn't enough to satisfy your South American cultural cravings, consider spending a few days exploring remote Easter Island. This tiny island, located 2,300 miles west of Chile is accessible by air from Santiago. 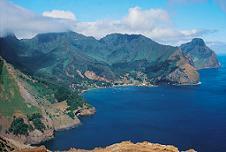 The island completes the Polynesian triangle of the Pacific Ocean, the other points being New Zealand and Hawaii. 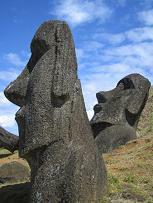 The island's most famous artifacts are the massive stone carvings called Moai, believed to have been erected centuries ago as signs of respect to the islanders' gods. The language, food, dance, crafts, and opportunities to explore the region's rich cultural heritage add a unique dimension to a trip to South America, and you can't help but feel a sense of appreciation and humility at the sight of the grassy green hills of extinct volcanoes melting into pacific blue waters. For a country whose average width could be spanned by merely 120,000 people holding hands, Chile has more than enough opportunities for adventure to keep you busy for months on end.